This small painting depicts a scene of a distant planet and its surrounding moons, viewed across a vast, empty boundary of space. On one side of the boundary drifts a cold, barren, lifeless terrain  on the other, a planet whose warm colors offer hope for a hospitable world. 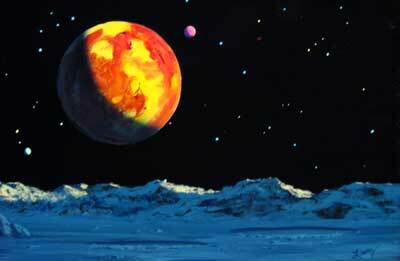 The painting is matted in dark blue and bordered by a striking fillet bearing the color of the distant planet. The piece is mounted in an attractive, glossy black scooped frame.